Ensuring user-friendliness for every workstation and technological intelligence at the very heart of your business, the Gigaset T500 IP Pro provides the optimal cornerstone for your telecommunications. This multi-faceted telephone switchboard makes telecommunication easy, economic and flexible. Your employees can make internal calls from corded phones, cordless phones and mobile phones, both within and outside the office. 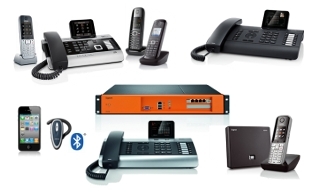 With this easily expandable system, you can conduct up to thirty calls simultaneously and you have access to an unlimited number of conference boxes. The integrated fax and voicemail server provides everybody with their own personal voicemail account. The call manager further increases the user-friendliness with functionalities such as the telephone book, calls via Outlook and caller information in the form of a business card and photo.